Request music for the Mozart Buffet with Randy Kinkel, every Sunday from 12 to 1. Request your favorite piece of music now! Enter a contest to win a Mozart Buffet coffee mug. By the age of 6 he was writing his own compositions. He wrote his first opera, Mitridate Re di Ponto, in 1770 when he was only 14 years old. While visiting the Vatican, Mozart heard Gregorio Allegri’s Miserere performed in the Sistine Chapel. He was able to write out the entire score from memory. Previously, the music had not been reproduced outside the Vatican. Haydn was full of praise for the young Mozart, telling his father there was no other man like him. Mozart and Haydn were good friends, and Mozart dedicated a set of string quartets to him. In 1784 he joined the Freemasons - an organization dedicated to mutual friendship. In April 1787, a 16-year-old Beethoven arrived in Vienna to get two weeks worth of music lessons from Mozart; but his mother became ill and he had to leave before he got the lessons. He married Constanze Weber in 1782. They had six children, but only two survived infancy. Both sons were musically talented, but only one went on to a career performing and writing music. Mozart earned a substantial sum from his successful operas, but he was extravagant in spending and often ended up in financial difficulties. He was a Roman Catholic and some of his greatest works were religious in nature. He died of kidney failure and was buried in a common grave with little fanfare, though that was common for the time. He had a pet starling that oculd sing the melody to one of his piano concertos. His Sister, Anna Maria, whom Mozart nicknamed "Nannerl" was as talented a pianist as Mozart was, and they often played together onstage as children. Mozart's Father Leopold was also a musician and composer. 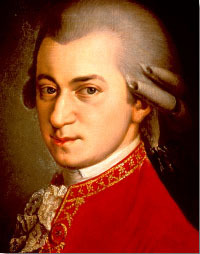 Mozart's "Requiem" was left unfinished when he died in 1791; it was completed by his student, Sussmayer, and others.